This beautiful Ember glow 1966 Ford Mustang Convertible is for sale in our Ft. Lauderdale showroom. This is one of the make and models that started an entire movement in the automotive industry! When Ford brought the epic Mustang to life, they single handedly started the Pony Car movement. 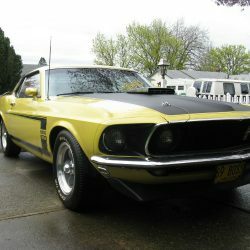 This 1966 Ford Mustang for sale is a survivor, with the looks and pedigree you want from a classic car. Perhaps the most iconic classic car, the Ford Mustang was introduced late in 1964 as a response to the improving economy of the early 1960’s, with consumers looking for smaller cars complete with performance and luxury. This one has that vintage look and everyday driveability that you’ll enjoy every time you take her out for a cruise. The Ember glow exterior is in fantastic condition with just the right tough of clean White striping adding to the sleek look. The matching two tone original interior is also in very good condition and feels as good as it looks. Under the hood is the original 200 cubic inch 6 cylinder and 3-speed automatic transmission. Drop the automatic top and let the wind blow through your hair as you cruise around town in this gorgeous 1966 Ford Mustang. This 1966 Ford Mustang convertable is a fun driver and ready to hit the streets, whether it be down to the local show, a weekend cruiser, or a summertime beach toy. Options on this Emberglo 1966 Ford Mustang Convertible for sale include; AM/FM Radio with Cassette, Automatic Convertible Soft Top, Vinyl Interior and Radial Tires. This 1966 Ford Mustang Convertible for sale is in our Ft. Lauderdale Showroom and can be seen in greater detail, including an HD video at http://www.GatewayClassicCars.com. Please call (954) 227-4202 or email us at fortlauderdale@gatewayclassiccars.com for additional information. If you like to see the 1966 Ford Mustang Convertible in person, you can visit the Ft. Lauderdale Showroom Monday – Saturday 9 am to 5 pm. Our address is 4020 NW 126th ave, Coral Springs, Fl 33065.